About Sadhoo Group :: Sadhoo Bikes (India) Pvt. 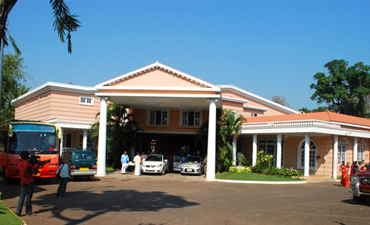 Ltd.
Sadhoo Group, a leading business conglomerate of Malabar region has interest spread over to multifarious fields. The inception of Sadhoo Group, 7 decades ago, was a humble venture by its founder, late Shri P.M. Kunjiraman. The founder who had an unambiguous foresight on business potentialities and whose interest always stood for the labor class, choose Beedi as his initial media and thus SADHOO BEEDI concept was transformed into accomplishment. Beedi is a hand-rolled tobacco product enjoyed by millions in India. Maintaining the consistency of quality coupled with hard work, his team could is no time conquer a vast market. SADHOO BEEDI is ranked No. 3 in respect of the market share today. The firm currently provides direct employment to thousands, and indirectly to countless, with its network in Kerala, Karnataka and Tamil Nadu. Sadhoo Beedi marketing network covers almost all southern states of India. A new division in Bicycle marketing in the brand name "SADHOO" started operation in 2010 and is managed by Sadhoo Bikes (India) Pvt. Ltd., with all kerala distribution network. The founder of Sadhoo Group had an unambiguous foresight on business potentialities and whose interest always stood for the labor class, choose Beedi as his initial media and thus SADHOO BEEDI concept was transformed into accomplishment. Beedi is a hand-rolled tobacco product enjoyed by millions in India. Maintaining the consistency of quality coupled with hard work, his team could is no time conquer a vast market. SADHOO BEEDI is ranked No. 3 in respect of the market share today. The firm currently provides direct employment to thousands, and indirectly to countless, with its network in Kerala, Karnataka and Tamil Nadu. Sadhoo Beedi marketing network covers almost all southern states of India.